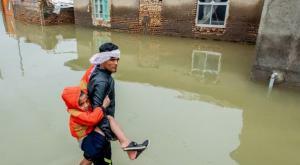 WASHINGTON, DC, USA, April 5, 2019 /EINPresswire.com/ -- For more than two weeks Iran has seen an unprecedented and devastating round of floods across the entire country. From north to south, 28 out of 31 provinces are dealing with floods, some with earthquakes, torrential rain and snow storms. Our hearts and prayers are with the flood victims. We commend the people of Iran and their grassroots efforts in aiding the victims and their families. OIAC welcomes U.S. Secretary of State Mike Pompeo’s announcement to “assist” the flood victims through “the International Federation of Red Cross and Red Crescent Societies.” It should however be ensured that any international aid would reach the people of Iran through local grassroots groups, international and independent monitoring groups and not the regime or any of its affiliated organs such as Iran’s Red Crescent. The astronomical devastation left in the aftermath of these series of natural disasters are direct result of the systemic abuse and the state-sanctioned exploitation of Iran’s ecosystem by the notorious Islamic Revolutionary Guards Corps (IRGC) and government officials at national and local levels. 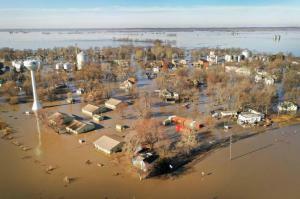 Four decades of ecocide, utter abuse and mismanagement of waterways, soil and land, deforestation, pollution has enormously contributed to devastating floods and unusual weather patterns. The state-run media and government officials refuse to acknowledge the catastrophic dimension of the ongoing humanitarian crisis. Eyewitness accounts and citizens’ reports from Iran, however, indicate that so far more than 250 people have been killed and several hundred are wounded and hundreds more are still missing. Tens of thousands of people have lost their homes and are struggling to recover. 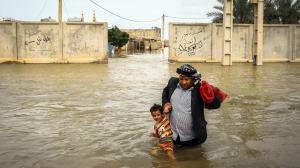 In the hardest hit areas like western town of PolDokhtar, more than 15,000 homes are destroyed. Access to shelter, clean water, sanitation, food and other basic needs continues to be non-existent in many flood-stricken towns and villages in Lorestan, Ilam, Khuzestan and several other provinces. The regime’s sheer incompetence and callousness displayed in management of this disaster and failure to expeditiously aid the victims is a true reflection of its overall destructive and inhumane nature. Reports indicate that in some areas where locals took the initiative to build flood shields to protect their homes, farms, and towns, the IRGC personnel opened fire at them, wounding several, in order to protect the IRGC-owned infrastructures. The United Nations must condemn the negligence shown by the mullahs’ regime. OIAC calls on all human rights and humanitarian relief agencies to directly aid the grassroots councils. OIAC also calls on all environmental groups and organizations to speak out in defense of climate justice in Iran. The solution to environmental, economic, social and political crisis in Iran is to replace the ruling regime with a democratic, secular republic government that truly strives for Iran and Iran’s people.